Thank you for the layout! Cheers from Spain. If I eliminate de 100k resistor, I must to add a volume pot in the output wire of the veroboard? what value? 100K lin or log, whatever you fancy in there. Output wire to Volume 3, Volume 2 to output, Volume 1 to ground. First off, the 80µF electrolytic is extremely hard to find, so i put in 33µF and 47µF in parallel. That way you can get 80µF quite easily with components that you may already have. 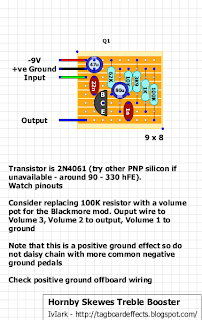 For transistor, i tried 2N3906 and 2N2907A. 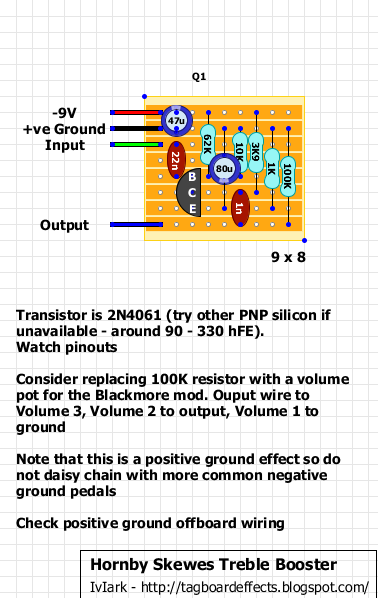 Latter sounds a bit better, but in this design there's hard limiting low pass filter at the end, so i don't think that transistor does make that much of a difference - hfe seems to be the one thing that counts. Socketed the ouput cap and tried it with 1n, 2n2, 3n3, 4n7, 10n and 100n. If you're building this, you might consider making that cap switchable and use the values you like the best. Personally i would go with three position two pole switch and use 2n2, 10n and 100n values. 100n does cut the bottom only very slightly, so you'll get much wider, moderately dirty boost. Nice little project, but in my opinion, it's not that much better from Screaming bird. They have distinct differences, but still. Rangemaster will get you similar results. Don't see myself boxing this anytime soon, but i probably will, at some point. great layout...real art in getting it with no cuts or jumpers. thanks for a fun, great sounding build! I have ended mine! very retro. I have done it with an old 2N4061 and a rotary switcher with the Mirosol caps, thank you men! 100µ will be fine, but if you want it to the specs, try 33µ and 47µ in parallel in its place. I built this recently and was severely disappointed. The input impedance is pretty low, so it sucked all the high end out of my guitar and just gave me a badly distorted mid-range sound. Rolling off the guitar volume actually brought back the treble, but now the level was a lot lower so it wasn't much of a booster. As an experiment, I did a reverse-Blackmore mod, I put a 100kA pot on the input instead of the output. Then I plugged in the highest gain PNP I could find, a BC560 with an hfe greater than 600. This worked really well, but only when using battery power. If I plugged in a 9V power supply, I got a lot of background hiss, but no change in the signal level otherwise. The supply is regulated and filtered, and it works fine with other treble boosters so I was baffled. I tried adding more bypass filtering in the effect and it made no difference. Then I added a 100R resistor in series with the 9V and the hiss went away. I've seen 100R in this position in other effects and now I guess I know why. This is now one of my favourite treble boosters, slightly cleaner and brighter than a Rangemaster. Incidentally, this design works differently from most treble boosters. Other boosters I've seen have a small input cap to filter out the lows coming in, so only the treble gets boosted. This one boosts everything coming in, then rolls off the lows on the output side. This seems to add a bit more grit to the lower strings when pushed hard. Really interesting not sure if my lower comment appeared but I've built it using original 2n4061 and it sounded a mess though voltages were right. Lots of noise even on battery and strange goings on when putting output pot to full. I may try your version. For now I've used vox booster biasing. It works but is quite underwhelming. And I thought this would be an easy Road back into pedal building. Doh! i thought that these were germanium at some point. i wonder has anyone used a germanium on this instead? i am a huge blackmore fan but his tone sounds like germanium to me especialy the way his tone cleans up when he rolls off the volume.